Dr. Neumayer, a renowned expert in breast cancer, women’s health and surgical education, will be the UA’s first female head of surgery and one of only six women surgery department heads in the nation. TUCSON, Ariz. – Leigh A. Neumayer, MD, MS, internationally known for her expertise in breast cancer surgery and research, advocacy for women’s health issues and leadership in surgical education, has been named head of the Department of Surgery and the Margaret E. and Fenton L. Maynard Endowed Chair in Breast Cancer Research at the University of Arizona College of Medicine – Tucson. The UA’s first female head of surgery, Dr. Neumayer is scheduled to begin her new leadership role on Aug. 18. She replaces Alexander G. Chiu, MD, who has served as acting head of the UA Department of Surgery since September 2013. “We are extremely pleased to welcome a surgeon and scientist of Dr. Neumayer’s caliber to lead the UA Department of Surgery,” said Joe G.N. “Skip” Garcia, MD, UA senior vice president for health sciences and interim dean of the UA College of Medicine – Tucson. “Dr. Neumayer is known for her strong commitment to educate our surgeons of the future and, as an internationally recognized physician-scientist, she is an excellent match for our institution’s mission and values and an ideal leader for our Department of Surgery,” Dr. Garcia added. “It is exciting to have Dr. Leigh Neumayer join the University of Arizona,” echoed Mike Waldrum, MD, MBA, president and CEO of The University of Arizona Health Network. “Dr. Neumayer is an exceptional clinician and multidisciplinary program builder who has championed evidenced-based, quality patient care and the team-based approach to care delivery. She will build on the existing strengths of the Department of Surgery and will be an outstanding surgeon-in-chief for UAHN,” Dr. Waldrum said. Dr. Neumayer currently serves as professor of surgery and vice chair for academic affairs at the University of Utah School of Medicine Department of Surgery, and co-director of the multidisciplinary team treating breast cancer at Huntsman Cancer Institute. She holds a Jon and Karen Huntsman Presidential Professorship in Cancer Research. She has long been an advocate for women’s health, both at the University of Utah and the Salt Lake City Veteran’s Affairs Medical Center. At the University of Utah, Dr. Neumayer directed the Building Interdisciplinary Research Careers in Women’s Health, funded by the National Institutes of Health (NIH), to assist junior faculty members to develop research initiatives in women’s health. She was instrumental in building a successful multidisciplinary research program in breast cancer at the Huntsman Cancer Institute, which includes basic, translational and clinic trial components. Dr. Neumayer’s clinical practice focuses on diseases of the breast, in particular breast cancer. She offers all surgical treatments for breast cancer, including breast conservation surgery with oncoloplastic reconstructions, and mastectomies of all types, including total skin sparing mastectomy. She works closely with reconstructive surgeons to ensure access to the latest reconstructive techniques. Dr. Neumayer has participated in many national clinical research trials and recently implemented a local trial (POWER PIINC) to determine the effect of a week of hormone-blocking therapy on breast cancer cells. She was principal investigator for the largest-ever randomized trial comparing inguinal hernia repair techniques at Veteran Affairs Medical Centers. The results of that trial were published in the article, “Open Mesh versus Laparoscopic Mesh Repair of Inguinal Hernia” in the April 29, 2004, issue of the New England Journal of Medicine. Currently, Dr. Neumayer is co-investigator on two other studies, including a NIH R01 grant to study non-invasive MRI-guided, high-intensity-focused ultrasound for breast cancer therapy. In May 2013, Dr. Neumayer was selected to participate as a fellow in the prestigious Executive Leadership in Academic Medicine (ELAM) program. The yearlong fellowship prepares senior faculty at medical, dental and public health schools to assume senior leadership roles at academic medical centers. “Dr. Neumayer’s selection and participation in ELAM underscores her deep understanding of the challenges facing academic health centers and showcase her skills as a leader capable of addressing these challenges in a positive, collaborative manner,” Dr. Garcia said. Dr. Neumayer has published more than 100 peer-reviewed scientific articles and book chapters. She is author of the book, “Meet Virginia: Biography of a Breast,” which pictorially chronicles a patient’s journey through her breast cancer surgery and serves as an educational resource for newly diagnosed breast cancer patients. She has served on numerous medical journal editorial boards and currently is an editorial board member of the Journal of the American College of Surgeons, Archives of Surgery and Annals of Surgery. She served as a director of the American Board of Surgery from 2005 to 2011 and was a member of the Executive Committee of the American College of Surgeons Board of Governors. In 2009, she was elected as a member of the Board of Regents of the American College of Surgeons. Past president of the Association for Surgical Education, Dr. Neumayer has been recognized nationally for her contributions as a surgical educator and tireless advocate for women in medicine. She also has served as president the Association of VA Surgeons and the Association of Women Surgeons. She is the first woman president of the Society for Clinical Surgery, a prestigious surgical society comprised of today’s thought leaders in American surgery. She is the recipient of many awards, including the Association of Women Surgeons Olga Jonasson Distinguished Member Award; the Association for Surgical Education Distinguished Educator Award, the most prestigious honor that ASE bestows on surgical education leaders; and the Dr. Clark Lowe Rich Distinguished Surgeon Award. 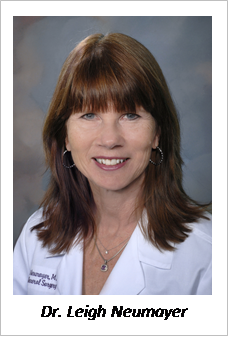 Dr. Neumayer returns to the UA Department of Surgery, where she completed her general surgery residency training in 1990 and served for two years on the faculty. Dr. Neumayer earned her medical degree from Baylor College of Medicine in Houston and her Master of Science degree in clinical research design and statistical analysis from the University of Michigan School of Public Health in Ann Arbor. She recently completed a fellowship in Executive Leadership in Academic Medicine at the Drexel College of Medicine in Philadelphia.